The first wave of feminism emphasised on women’s emancipation and equality, whereas the second wave focused on female oppressions and struggled for their liberation. The third wave stressed the individual empowerment. 1) The Marxist feminism confined to united struggle for women’s rights. 2) The socialist feminism exposed the gender aspects of welfare state. 3) The liberal feminists struggled for the empowerment and public participation of women, 4)The individual feminism aimed at personal abilities of woman, 5) The career feminism inspired women to free in the ‘World of Men’, 6) The global feminism insisted the boundary breaking activities for women’s empowerment and reorder the rules, 7) The radical feminists bounded to entire change in social structure for equality, 8) The lesbian feminists denied the need of men for existence of women, 9) The black feminists struggled for equality within the races and Dalit within castes, 10) The womanism supported the self-identity and -respect, 11) The cultural feminists and literature explained the cultural roots of discriminations and exploitations of women, 12) The eco-feminists focused on environmental aspects and resources related to women. However, 13) The existentialists are conscious about interdependence. The feministic analyses are active, challenging and important for social welfare. Marxist and socialist feminists struggled for women’s rights. Radical feminists confined to entire change in social structure for equality. 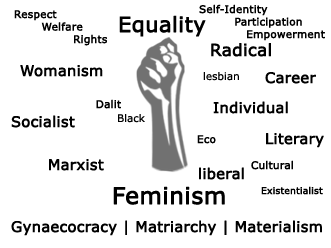 Feminists focused on gender equality, women’s emancipation and empowerment. Men have control over women’s sexuality and labour. Feminism is an effective and useful tool for social welfare. Liberal, individual and career feminists aimed at participation, empowerment and emancipation of women.